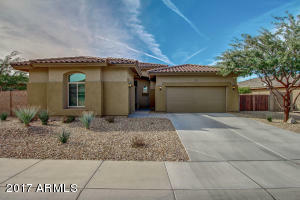 Immaculate home in sonoran mountain ranch on a larger lot with rv gate, rare find - move in ready! Beautiful appointed 4 bedroom, 3 bath, split floor plan with white plantation shutters throughout. Eat-in kitchen features gas range, in wall oven, granite countertops with tiled backsplash. Spacious master with large bathroom and closet, double sinks, separate shower/tub. Backyard just the way you want it - pavers, a ramada, and a cozy fire pit. And if you so desire plenty of room to put a pool in. Spotless home, larger lot, rv gate! Directions: Start From 67th ave & happy valley. From there, go N on 67th ave. 67th ave turns into pyramid peak pkwy. Left on chalfen blvd. Left on 70th lane. Left on w miner trail. Right on 70th ave to property on right hand side.